Indian Air Force offers opportunities for UNMARRIED MALE INDIAN CITIZENS from designated districts of state of Gujarat, Union Territory Of Daman & Diu and Dadra & Nagar Haveli to join as Airmen. 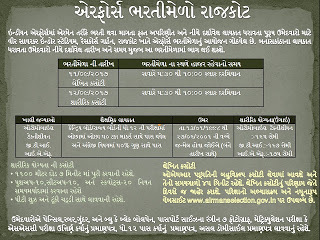 The Recruitment Test for Group „Y‟ (Non-Technical) [for Automobile Technician, Ground Training Instructor and Indian Air Force (Police) only] Trades will be held at Vir Savarkar Indoor sports Stadium, Race Course Road, Rajkot and SAMA Indoor Stadium, New Sama, Vadodara as per the Selection Programme given below. requirements and eligibility conditions and reporting up to 10 AM on 11 September 2017 and 19 September 2017 at the Rally Venue will only be permitted to appear in the Recruitment Test. Date of Birth Block. : Candidates born between 13 January 1998 and 27 June 2001 (both days inclusive) are eligible to appear in the Recruitment Rally. Educational Qualification. :Candidate should have passed Intermediate / 10+2 / Equivalent Examination in any stream/subjects approved by Central/ State Education Boards with minimum 50% marks in aggregate and 50% marks in English. (a) The School / College / Institute from where candidates have passed the qualifying examination should be within the geographical / administrative limits of designated districts (as specified in para 2 above) of state of Gujarat or UT of Daman & Diu or Dadra & Nagar Haveli. If the name of district is not mentioned with the name of Institution in the certificate / marks sheet of qualifying examination, the candidates are to produce „Domicile Certificate‟ issued by SDM/DM/Executive Magistrate or any official authorized by the State Government of Gujarat or Union Territories of Daman & Diu and Dadra & Nagar Haveli. (b) Permanent Domicile of designated districts (as specified in para 2 above) of state of Gujarat or UT of Daman & Diu or Dadra & Nagar Haveli who have passed the qualifying examination from anywhere in India are to produce the Domicile Certificate prior to commencement of examination from appro- priate authority as given in sub-paragraph 5(a) above. (c) Sons of serving Air Force personnel whose father/mother is presently serving in any Air Force Unit located in designated districts (as specified in para 2 above) of state of Gujarat or UT of Daman & Diu or Dadra & Nagar Haveli, irrespective of their domicile status, are permitted to appear in the rally subject to production of Son of Serving Air Force Personnel (SOAFP) Certificate (format available on AFNET CASB website). (d) Sons of Retired/Discharged/Deceased Air Force personnel residing in designated districts (as specified in para 2 above) of state of Gujarat or UT of Daman & Diu or Dadra & Nagar Haveli, are permitted to appear in the rally subject to production of proof of minimum stay of one year along with original and a photocopy of Discharge Book/Service Certificate issued from AFRO/DAV. must be physically and mentally FIT to perform duty in any part of the world, in any climate and terrain. Written Test. : Written Test will be objective type and question paper will be bilingual (English & Hindi) except for English paper. Answers are to be annotated on OMR sheet. Detailed procedure shall be explained before conduct of the examination. Duration of the written test will be 45 minutes and will comprise of English as per 10+2 CBSE syllabus and Reasoning & General Awareness (RAGA). CANDIDATES ARE TO QUALIFY IN EACH PAPER SEPARATELY. Results of the written test will be declared on the same day. Adaptability Test-1. All candidates who pass the Written Test will have to undertake Adaptability Test-1 which is to assess suitability of a candidate for employment in the IAF which involves deployment in varied geographic terrain, weather and operational conditions. the stipulated time to qualify in the Physical Fitness Test. Note: Candidates are advised to bring their sports shoes and shorts. candidates who can adapt to the environment of Indian Air Force and are able to adjust to the military way of life. Medical Examination. :Candidates who qualify Adaptability Test-2 will be medically examined in the month of January 2018 at Air Force Station Cotton Green, Mumbai. Medical Examination will be conducted by Air Force Medical Team as per IAF medical standards and existing policy in vogue. (a) Blood Haemogram - Hb, TLC, DLC (b) Urine RE/ME (c) Biochemistry:- (i) Blood Sugar Fasting & PP (ii) Serum Cholesterol (iii) Urea, Uric acid, Creatinine (iv) LFT—Serum Bilurubin, SGOT, SGPT (d) X- Ray chest (PA view) (e) ECG (R) Candidates declared Medically Unfit can avail the option for Appeal Medical Board (AMB) against their Unfitness by depositing Rs. 40/- in a Government Treasury/RBI/SBI through Military Receivable Order (MRO). The application for AMB along with original copy of MRO and photocopy of Unfitness Certificate are to be submitted to the representative of 6 Airmen Selection Centre within three working days of medical examination. AMB Centre will be SMC, Air Force Station Lohegaon, Pune. subsequent years may rise as per the career progression of the individual. Selection Process: Candidates will be selected based on Verification of Eligibility, Written Test., Adaptability Test-1, Physical Fitness Test (PFT), Adaptability Test-2 & Medical Examination. How to Apply: Examination/Rally venue will be open from 0600h-1000h and the examinations will be conducted as per the details are given below. Candidates (from designated districts of state of Gujarat and UT of Daman & Diu and Dadra & Nagar Haveli only as per schedule given below) fulfilling the domicile requirements and eligibility conditions and reporting up to 10 AM on 11 September 2017 and 19 September 2017 at the Rally Venue will only be permitted to appear in the Recruitment Test. Note: The Recruitment Test is not for selection as Commissioned Officers/ Pilots/Navigators. Recruitment Rally for Auto Tech, GTI, IAF(P) trades will be conducted at Rajkot from 11-09-2017 to 13-09-2017. Recruitment Rally for Auto Tech, GTI, IAF(P) trades will be conducted at Vadodara (Gujarat) from 19-09-2017 to 21-09-2017.